The thing about history plays is that we all already know what happens. There can be no M. Night Shyamalan plot twist. So the journey needs to be dynamic and engaging. The psychic insight needs to be penetrating. The characters need to be charismatic. Richard Nixon and his story are none of those things. In Checkers, a new play by Douglas McGrath and directed at the Vineyard Theatre by Terry Kinney, what we “learn” about Nixon (as the story – told through flashbacks – shows us what led up to the famous “Checkers” speech) is that he is paranoid and always feeling like an outsider. Then again, maybe it’s just my perspective. As I walked out of the theatre, the two older women ahead of me were commenting that there were moments they hadn’t known about. They found it interesting. These are women who lived through Nixon and Checkers. I didn’t, but I’ve studied politics throughout my entire academic career – including a master’s degree in political management. 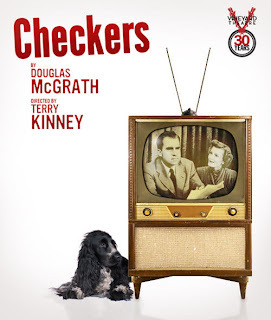 So it’s possible not everyone who see this or thinks about seeing it has retained as much about the events as I do, and therefore might find Checkers intriguing, since they don’t know what’s going to happen. Still, I found this boring and only sporadically chuckle worthy. It doesn’t reveal anything about Nixon (Anthony LaPaglia), his campaigns, politics and relationship with his wife, Pat (Kathryn Erbe), we don’t already know and it doesn’t even rehash the old in a fresh, engaging way. You’d be better off staying home and playing a game of chess.